Very few water treatment and wastewater treatment operators can pass their license and certification exams without putting in the time to study and review the required material. In fact, the nationwide pass rate runs about 50%. Only half of those taking a license or certification exam passes. If you’re like most people, you’re busy and your time is limited. That’s why it’s important to create a plan that prioritizes your study time to make sure you’re prepared on test day. We recommend you develop a study schedule and make a commitment to faithfully stick to it. Don’t stay up late “cramming” the night before the test! At American Water College, we’ve created a plan for you. Our students who stick to the schedule and follow the plan have a 99% pass rate nationwide on their exams. You can enroll in one of our Guaranteed Exam Prep Courses by clicking on the link. One reason only half of water and wastewater treatment operators pass their state certification exams each year is the failure to create and stick to a study plan. 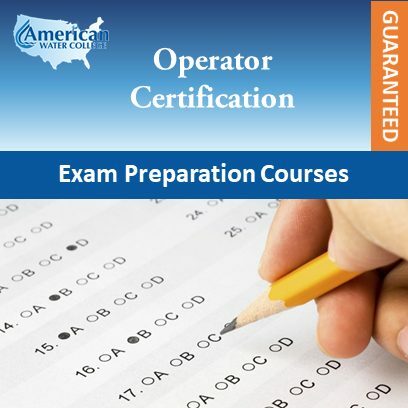 American Water College has developed a proven exam prep system which includes a study plan you can follow. As a result, 99% of American Water College students who follow the plan, pass their exams the first time. You can increase your likelihood of success on your next exam to almost 100% by planning your work and working your plan by using either the process outlined in our FREE “How to Prepare to Pass Your Certification Exam” course or by using one of our Guaranteed Exam Prep Courses.